When the first wave of Jews began moving to Martinsville between 1909 and 1915, the town had a population of about 4,000 people, the newspaper published once a week, and four men constituted the police force. In fact, Martinsville did not declare itself an independent city from Henry County until 1928. From the time colonists first made their way to the area in the 18th century until the Civil War, the regional economy was driven by tobacco plantations and slave labor. After the Civil War, landowners continued to rely on tobacco as their main crop, but in order to make it profitable, they converted the leaves into hard blocks of chewing tobacco. Martinsville and the surrounding area became known as the “Plug Tobacco Capital of the World.” Martinsville got its own stop on two railroad lines by the 1890s: the Norfolk and Western line; and the Danville and Western line, which connected the town to Richmond, Norfolk, and the greater Northeast. Industrialization took hold in Martinsville as the tobacco economy declined and the furniture industry emerged as the main economic force. In 1925, 40 percent of the working population of Henry County was employed by the furniture industry. Martinsville’s rise as an industrial center led to an influx of workers in search of factory jobs and entrepreneurs looking to benefit from the prosperity. Included in this group was a small number of Eastern European Jews who would open clothing stores in Martinsville and form the foundation of a small Jewish community. The first Jew to settle in Martinsville was likely Samuel Heiner in 1888, though there is no evidence of other Jews living in the town until around 1910. Heiner was born in Odessa, Russia, in 1867 and lived in Baltimore before moving to Martinsville to run a clothing store with his father in 1888. From then until his death in 1929, Heiner was a leading merchant in Martinsville. Although he returned to Baltimore for several years, he spent the vast majority of his adult life in Martinsville. In later years, Heiner opened clothing stores in five towns near Martinsville, including Bassett and Rocky Mount, Virginia, and Madison, Stoneville, and Reidsville, North Carolina. Abraham Fusfeld, born in Brody, Austria in 1866, opened a tailor shop in Martinsville around 1911 after brief periods in Sioux Falls, South Dakota, and Duluth, Minnesota. In 1925, he decided to start selling clothes and opened Fusfeld Sample Store. Samuel Kolodny, born in Pinsk, Russia in 1890, escaped compulsory military education in Russia and came to Martinsville soon after arriving in America in 1911. He worked for Sam Heiner until 1915 when he opened his own store. In 1914, Kolodny married Abraham Fusfeld’s daughter, Frances, who was helping her father run his tailor shop. Sam and Abraham partnered to create the Fusfeld-Kolodny Department Store in 1929, although Fusfeld died two years later. Sam renamed the store Kolodny’s, which became a staple of local business in Martinsville for many years. 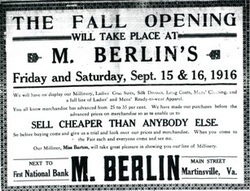 Max Berlin, born in what is now Lithuania in 1889, started Berlin’s Department Store in Martinsville in 1911, which he operated until 1955. He also started Martinsville Distributing Company, a wholesale clothing business, which he ran until his death in 1968. Abe Globman of Ozarich, Russia immigrated to Philadelphia in 1911 at the age of 16. He peddled shoelaces and handkerchiefs from a pushcart, making three dollars a week, before moving to Waynesboro, Virginia, in 1913 to work for a friend for five dollars per week. After two years in Waynesboro, Abe had saved some money and wanted to start his own business. Following the recommendation of a salesman, he visited Martinsville and was impressed enough that he rented a vacant storefront on the courthouse square and opened Globman’s Department Store. Even before Jews formed a congregation in Martinsville, they were publicly accepted in the greater community. On Rosh Hashanah eve in 1925, the Henry Bulletin, the local newspaper, published a short article with the headline “Jewish New Year Will Be Observed." The article explained the holiday’s significance for Jews and noted that there were advertisements in the paper showing which Jewish owned stores would be closed. In the last sentence, the writer opined, “We must commend them [ local Jewish merchants] for their devotion to a custom the practice of which has always had a salutary influence upon the lives of millions of the Jewish Faith.” The Martinsville community celebrated the presence of Jews and encouraged them to practice their religion. In 1927, Martinsville Jews finally established a congregation, which they named Ohev Zion (Lovers of Zion). That same year, the small congregation built a synagogue, raising part of the $15,000 cost from non-Jews in the community. This help was necessary since only 46 Jews lived in Martinsville at the time. The local newspaper noted that Ohev Zion’s synagogue was built by only five families. The founders of the congregation included the Fusfeld, Heiner, Berlin, Kolodny, and Globman families. Abraham Fusfeld served as the first president. Beth Israel Synagogue in Roanoke advised Ohev Zion about acquiring prayer books and a Torah and on the construction of the synagogue. Not surprisingly, Ohev Zion’s first synagogue greatly resembled that of Beth Israel. As most American towns struggled through the Great Depression, Martinsville flourished as it attracted many Northern textile companies drawn by lower labor costs. Although Martinsville Jews were still concentrated in the retail clothing business, there was one Jewish textile factory manager. Saul Schreibfeder, born in Kusmin, Russia, in 1888, came to America in 1904 and lived in New York for 16 years before moving to Baltimore, where he worked as a tailor and clothing cleaner among other things. In 1933, Schreibfeder moved to Martinsville to manage a new textile plant for Jobbers Pants Company, a subsidiary of Standard Overall Company in Baltimore. Schreibfeder’s greatest accomplishment as manager came in 1936 when he opened another pants factory in a wooden dance hall and convinced company executives in Baltimore to allow him to hire 50 African American women, unprecedented at the time in Martinsville. At first only a test run, the factory employed 1,000 African American women by 1939 and produced over 14,000 pairs of pants per day. With the help of African American community leaders, Schreibfeder oversaw the construction of a permanent pants factory in the African American business district. He managed four Jobbers Pants factories in total in Martinsville, and became a stalwart in the community before he died in 1960. Meanwhile, Globman’s Department Store gradually established itself as a mainstay in downtown Martinsville. By 1935, it had grown from its original 2,000-square foot building to a three-story, 13,000-square foot building. In 1944, Abe Globman bought a piece of property in a residential neighborhood for another potential expansion. Several years later, he commissioned a new 54,000-square foot Globman’s to be built on the lot, and on May 11, 1950, the grand opening, which included a ceremony with the mayor and a live orchestra, attracted thousands of people. The store doubled in size in 1961 and became the first in the area to install escalators. Globman’s epitomized the “family business” from its beginning until it closed in 1991. Abe Globman and his wife Masha worked in the store from 8 a.m. until dark on weeknights and midnights on Saturday. Masha cooked dinner for her two children, Leon and Claire, in the store and on late nights would put them to sleep on fabric counters until the store closed. In 1929-1930, Abe opened two new Globman’s locations, one in Galax, Virginia and the other in Leaksville, North Carolina. His sister Rose and her husband Nathan Potolsky managed the Galax branch for the next 55 years. Masha’s sister Ceil and her husband Herman Kessler ran the Leaksville store. When Abe Globman died in 1979, his grandson Barry Greene became President of Globman’s while Abe’s son Leon became Chairman of the Board. Richard Globman, son of Leon, became vice president of the company. Not only business leaders Globmans were also leaders at Ohev Zion as Abe often led services in the early years while Masha sat in the front pew and chanted with him in Hebrew. After services, the Globmans hosted the congregation at their home for Shabbat dinner. Barry Greene described these dinners in his eulogy for his grandmother: “And after services, it was always to Masha’s home---family and friends, 30 or 40 for the traditional Kiddish over wine and piles of delicacies from the old country---Matzo Ball soup, Masha’s special Gefilte Fish, and more.” The Globmans’ hospitality also extended to Jewish newcomers. Whenever a new Jewish family came to town, they often lived with the Globmans until they found a place to live, while the entire Jewish community would help find them work. In Ohev Zion’s early years, laypeople would lead services and run the Sunday school, while on the High Holidays, the congregation would bring in a visiting rabbi. 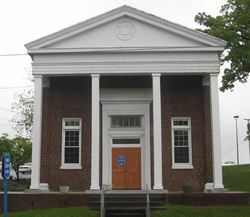 The founders of the congregation, who were first generation Eastern European immigrants, brought their Orthodox Jewish practices to Martinsville. Abe and Masha Globman kept a kosher kitchen when they first moved to Martinsville and would order their meat from Baltimore and Charlotte. Nathan Weinstein, who moved to Bassett in 1925 to manage a store, would make the ten mile drive to Martinsville and stay in a hotel on Friday nights to observe Shabbat. The Weinsteins would travel to Baltimore when a newborn child was expected so that the child could have a proper baby-naming or bris. Over time, the members of Ohev Zion conceded that certain traditions that could not easily be kept in a place like Martinsville and many stopped keeping kosher. Historically, Ohev Zion’s services would best be described as Conservative. While they did not join the United Synagogue until 1959, their services were Conservative in style for many years. When the congregation needed to find a rabbi in 1968, they asked the United Synagogue to help them find one. When their request went unfulfilled, the congregation asked the Union of American Hebrew Congregations (UAHC) for help in finding a rabbi. In order to get a rabbi from Hebrew Union College, Ohev Zion had to join the UAHC, officially aligning themselves with the Reform movement. However, the congregation maintained a semblance of its Conservative identity, using Reform prayer books on Friday nights and Conservative prayer books on Saturdays and High Holidays. In the late 20th century, Ohev Zion decided not to renew its membership with the UAHC, citing declining membership and a lack of children who could benefit from the union’s services. The congregation remains unaffiliated today. Ohev Zion reached its peak membership around 1960, with about 50 families and 40 children in its Sunday school. In 1961, the congregation built a new synagogue, which continues to serve as Ohev Zion’s home today. The synagogue was the hub for Jewish social and organizational activity. Martinsville’s Jewish clubs included B’nai Brith, Hadassah, a youth group, and a Sisterhood, which would hold an annual rummage sales that raised over $10,000 per year. Despite the small size of the congregation, Ohev Zion was able to employ a full-time rabbi almost continuously from 1949 to 1997. The first was Fred Sussman, who served from 1949 to 1950. Other rabbis that served the congregation included Hyman Goodkowitz (1950-1953), Mordecai Thurman (1954-1968), Milton Schlager (1970-1980), Harold Friedman (1980-1989) and Tamara Miller. After Rabbi Miller’s tenure at Ohev Zion, the congregation decided that its small and declining membership did not require a full-time rabbi. Since 1997, Ohev Zion has maintained a close working relationship with the Conservative Beth David Synagogue in Greensboro, North Carolina. Beth David provided Ohev Zion with multiple rabbinic visits during the partnership. Since 2005, Beth Socol of Greensboro has been leading services at Ohev Zion, making the one-hour drive to Martinsville every other Friday and for the High Holidays. Martinsville’s rabbis have often been closely involved in community activities. Rabbi Thurman and Rabbi Schlager were both active in Christian-Jewish interfaith organizations. Shortly after Schlager arrived in Martinsville, he was elected president of the local ministerial association and attended Christmas dinners with Christian clergy. 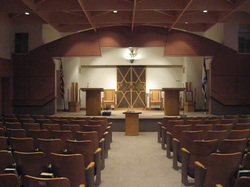 Upon his appointment as president, the rabbi said, “In some Virginia cities, some closer than you think, this could not happen.” The local hospital installed a “Jewish flag” in its chapel to accompany the “Christian flag” and presented Rabbi Schlager with a “portable synagogue” kit to help him attend to the Jewish sick. The congregation continues to partner with local churches for various events, including a recent teach-in commemorating Martin Luther King Jr. The members of Ohev Zion were also very involved in the larger community. Barry Greene served as mayor of Martinsville in the 1970s. Dan Greene, Barry’s father, co-founded the Martinsville Little League and Martinsville Recreation Association, and in his honor, Martinsville High School’s stadium bears his name. Dan also founded and was the longtime director of the charitable organization Christmas Cheer, which provides food, clothing, and toys for poor families. Many Jews belonged to local fraternal and civic groups, like Kiwanis, the Elks Lodge, Patrick Henry Lodge, and the Knights of Pythias. Abe Globman received the National Brotherhood Award from the local chapter of the National Conference of Christians and Jews. In 1986, Globman’s Department Store won an NAACP award for their work towards better race relations. Martinsville Jews have served on the city council, as presidents of the local hospital and the Virginia Retail Merchants Association, and as directors of the Forest Park Country Club. During the post-war years, Jewish-owned stores continued to proliferate in Martinsville. In addition to long-standing businesses like Globman’s and Kolodny’s, a handful of new Jewish families moved to town in the 1950s. Marty Kravitz came to Martinsville from Brooklyn and opened Russell’s Clothing Store while the Altschull family arrived from Baltimore to open The Bargain Center. Martinsville was one of the wealthiest towns in America per capita in the 1960s as textile factories continued to thrive. From the 1950s until the early 1990s, Martinsville was known as the “Sweat Shirt Capital of the World.” In the early 1970s, the unemployment rate in Martinsville was 1.9%, less than half of the state average. Jewish merchants thrived along with the city itself. Despite post-war prosperity, Martinsville’s fortunes have steadily declined since the 1980s and today, the city has the highest unemployment rate in the state of Virginia. Martinsville has suffered greatly from the outsourcing of clothing manufacturing; between 1993 and 2002, the city lost more than 9,000 jobs and almost all of its factories have been closed down. Today, much of Martinsville’s downtown is vacant or has been torn down. In 1970, Martinsville had a population of 19,653; by 2010, it had shrunk to 13,821. This reversal of economic fortune has also affected the local Jewish community. The decline along with the emergence of malls and megastores dealt a major blow to Globman’s and other Jewish-owned stores in Martinsville. When Globman’s Martinsville store shut down on March 31, 1991, the Martinsville Bulletin published a large feature story commemorating the history of the business and its contributions to Martinsville. ​According to Richard Globman, grandson of Abe, “the congregation is going the way of the community.” Jewish children who grew up in Martinsville over the last 40 years have moved on to bigger cities with more opportunities, and consequently, Ohev Zion has not had a Sunday school in over a decade. In 2013, Martinsville’s Jewish population consisted of approximately 25 families, mostly elderly. About 40 people attended a recent community seder. Board members have put together a last will and testament for the congregation, including an agreement with the Greensboro Jewish Federation to oversee maintenance of the Ohev Zion Cemetery after the congregation shuts down. Although Martinsville’s Jewish community is declining, its legacy will live on.